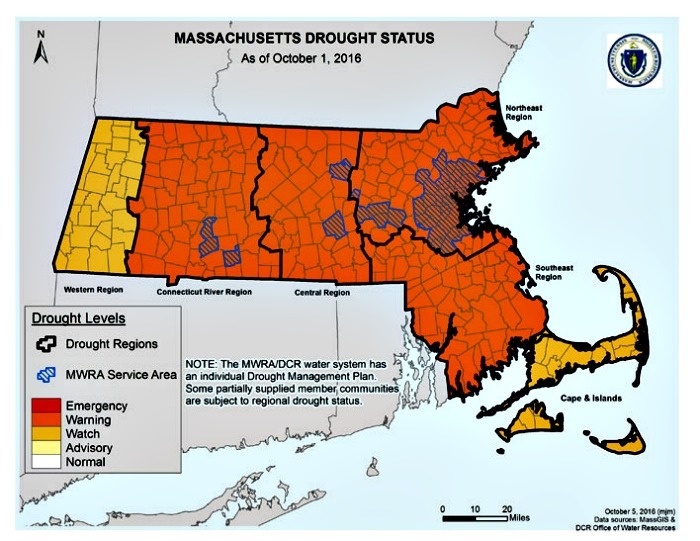 After seven straight months of below-average rainfall, all outdoor water use should be banned in all parts of Massachusetts except for Berkshire County and Cape Cod and the Islands, the state Office of Energy and Environmental Affairs announced last week. Energy and Environmental Affairs Secretary Matthew A. Beaton of Shrewsbury elevated the western region of the state from a drought advisory to a drought watch on Friday, and elevated the Connecticut River Valley from a drought watch to a drought warning, following the recent recommendation of the state’s Drought Management Task Force. 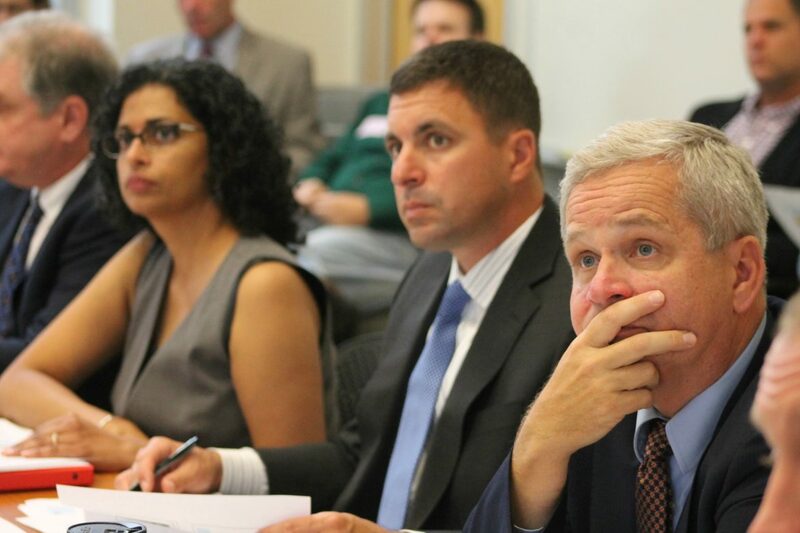 With each heightened classification, the state ramps up its messaging around water conservation, a stronger push for water-use restrictions, and more intensified monitoring. Water suppliers in regions under a drought warning are urged ban all outdoor water use, and those under a drought watch should limit outdoor water use to handheld watering after 5 p.m. or before 9 a.m., according to the task force. The state has been under its own official drought declaration since July 1. More than 98 percent of the state is experiencing a “moderate” drought or worse, and the remaining bit of the state, near North Adams, is “abnormally dry,” according to the U.S. Drought Monitor. Eight years after Massachusetts voted to decriminalize the possession of less than an ounce of marijuana, racial disparities in arrests for marijuana possession have continued, a report from the American Civil Liberties Union of Massachusetts found, and they disproportionately affect African-Americans. The report, released Oct. 6, found there were 616 marijuana possession arrests in Massachusetts in 2014 and 1,031 arrests for marijuana sales. The report does not say what, if any, other charges those arrested also faced. The report, which used FBI crime data from 2014, found that the marijuana possession arrest rate for African-Americans was 3.3 times higher than that for white people. The report found that in Worcester County, African-Americans were arrested at 3.2 times the rate of white people for marijuana possession, and 7.5 times the rate of whites for marijuana-sales arrests. While black people account for 8 percent of the state population, the ACLU said they comprise 24 percent of marijuana possession arrests and 41 percent of marijuana sales arrests. Hall and other supporters of Question 4 — which would legalize, regulate and tax marijuana for adults 21 or older — said that legalizing cannabis could help eliminate some of the racial disparities. “Taxing and regulating marijuana is an important step towards reducing the harm that current policies cause to people of color, particularly black people, and it will generate hundreds of millions of dollars in tax revenue that can be reinvested in our communities,” Hall said. Legalization opponents pointed to data from Colorado’s Department of Public Health and Environment that showed that racial disparities have become more pronounced since that state legalized cannabis. A report released in March found that although the number of total marijuana arrests was cut in half, black Coloradans are now arrested for marijuana offenses at nearly three times the rate of white people. Before legalization, black residents were being arrested at just under twice the rate of whites. “This is a highly misleading report because the Yes on 4 campaign can not tell you whether people were arrested for other serious crimes in conjunction with marijuana charges,” Corey Welford, spokesperson for the Campaign for a Safe and Healthy Massachusetts, said in a statement in response to the ACLU report. While on a visit to highlight new quarantine procedures for animals, Gov. 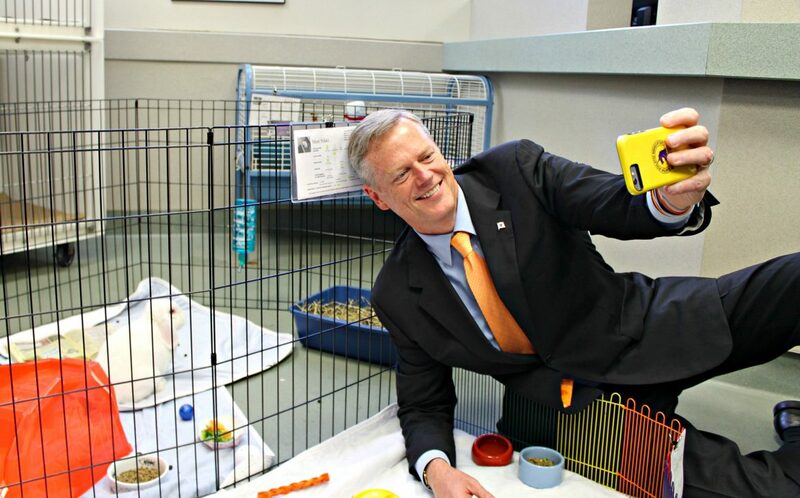 Charlie Baker, a prolific selfie-taker, got down on the floor of the Animal Rescue League of Boston on Monday and attempted to take a picture with Nikki the albino rabbit. BOSTON – The Massachusetts Department of Environmental Protection (MassDEP) has issued a $30,000 penalty to 402 Grove Street Realty LLC and Altab Inc. for violating state oil and hazardous materials cleanup regulations at their properties at 400 and 402 Grove St. The site includes a two-story commercial building and a standalone, next-door restaurant, Ciao Bella. MassDEP found that the property owners failed to conduct necessary assessment and indoor air monitoring at the site. In April 2013, MassDEP conducted an audit of the remediation work completed to date, and found the companies had failed to conduct assessment and monitoring to ensure groundwater contamination was controlled and vapors were not impacting indoor air in the buildings at the site. The firms also failed to submit required periodic status reports to MassDEP to verify that a vapor-mitigation system was continuing to operate properly. As part of a consent order, the companies must fully assess measures to control groundwater and indoor air contamination, and must further evaluate cleanup options. They must also pay $5,800 of the assessed penalty, with the remaining amount suspended as long as the companies meet their requirements and do not violate any other regulations for a year. Licensed hunters will again have the chance to participate in a state-sanctioned hunt aimed at bringing the deer population in The Blue Hills State Reservation under control, as part of a plan approved by the state Department of Conservation and Recreation last week. According to DCR, this year’s hunt will take place Nov. 29-30, as well as Dec. 6-7, falling within the state’s shotgun season. Similar to last year’s controlled hunt, hunters will need to apply in order to participate in the four-day event aimed at managing the overpopulation of deer. Over a four-day period last year, hunters took a total of 64 deer in the 7,000-acre reservation. Last week’s plan was approved in consultation with the state Department of Fish and Game, the Massachusetts Environmental Police, and Massachusetts State Police.